Kombucha (or booch as we affectionately call it) is a fermented tea drink. It is said to maintain a healthy balance in your gut bacteria and to boost your immune system. Kombucha's origins date back 2000 years, and it is a delicious and healthy alternative to soft drinks or alcohol. a wide mouthed jar to hold between 1.5 and 2 litres. Bring 500 ml of water to a boil in a pan and then turn off the heat. Add the sugar and tea leaves or bags and stir until all the sugar is dissolved. Place a lid on the pan and leave to steep for approximately half an hour. Fill a clean, wide mouthed jar with 500 ml of cold water. Using a sieve strain the cooled tea/sugar mixture directly into the cold water. Cover the mouth of the jar with a clean tea towel or piece of cloth, and leave it until the sweet tea mix has completely cooled. Pour in your starter tea and SCOBY, replace the material covering over the mouth of the jar and secure with string or an elastic band. 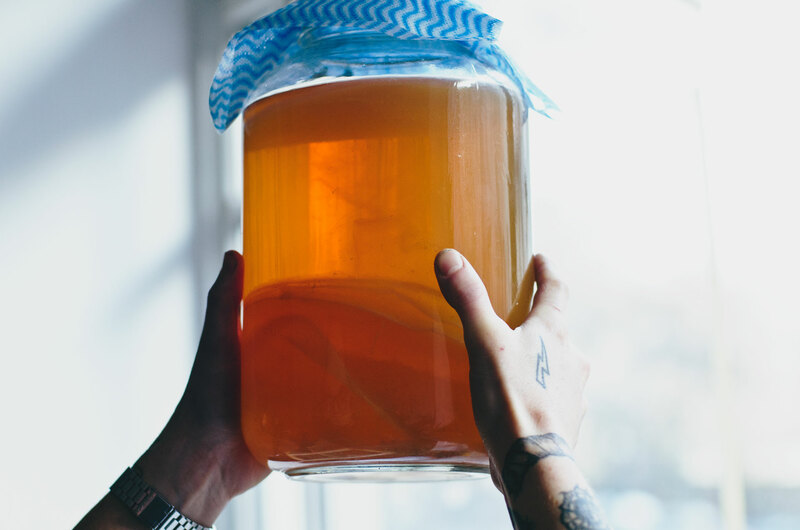 You can now leave the tea and SCOBY somewhere at room temperature and out of direct sunlight to ferment. The SCOBY might float around a bit or stay at the top, but it will form a new layer on the surface of the tea. You can leave this for around 10 days (times depend on the surrounding conditions such as temperature), but it is really up to you. Taste the kombucha and if you would prefer it to be a little more sour, leave it a little longer. If you leave it too long, all the sugar will ferment into vinegar (which you can use in cooking) which might not be so pleasant to drink. Once the kombucha has fermented to your liking, you can pour it into bottles and refrigerate. 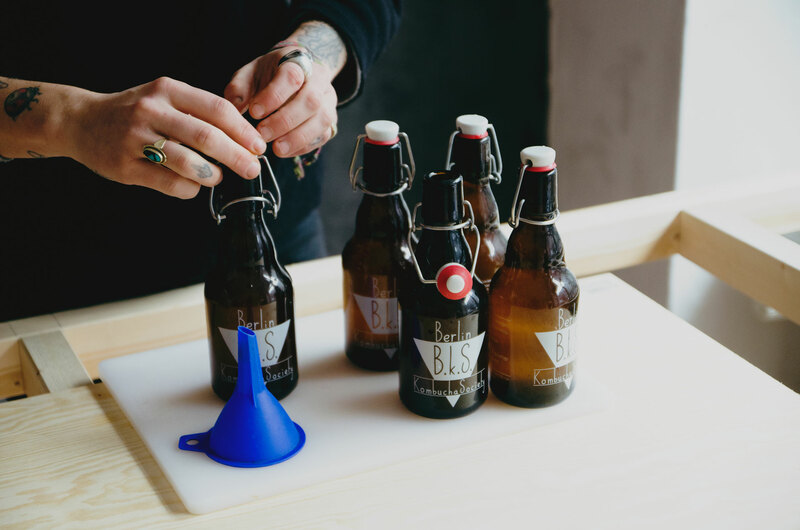 Remember to keep some of the finished kombucha and the SCOBY for your next batch, which you should start at the same time as you bottle the rest. If you want to add some flavours and a carbonation for your drink, see the Apple and Cinnamon Kombucha – Second Fermentation recipe.